Within Belfast’s City Hall, the changing and increasingly shared nature of commemoration in Northern Ireland is reflected in the stained glass windows and memorials which honour groups as diverse as the 1907 dock strikers led by Jim Larkin, the Belfast men of the International Brigades, the 36th Ulster Division who served at the Battle of the Somme, and the now disbanded Royal Ulster Constabulary. Twenty seven years have passed since Northern Irish literary critic Enda Longley proclaimed that “commemorations are as selective as sympathies. They honour our dead, not your dead.” That such distinctly Unionist and Republican symbols of remembrance can sit alongside one another inside City Hall would have been unimaginable when Longley penned those words, but so too would the idea of a Sinn Féin Lord Mayor. The first, Alex Maskey, was only elected in 2002. Given the changing composition of Belfast City Council, there was a certain inevitability to the debate around the statues which sit outside of the building. Queen Victoria, the work of sculptor Thomas Brock, has taken pride of place since 1903, surrounded by Victoria Cross recipient James Magennis, Conservative politician Sir James Horner Haslett and Harland and Wolff founder Edward James Harland, amongst others. The grounds of City Hall lack diversity contained inside, something identified by an Equality Impact Assessment which called for the inclusion of monuments reflecting other narratives in the history of the city. 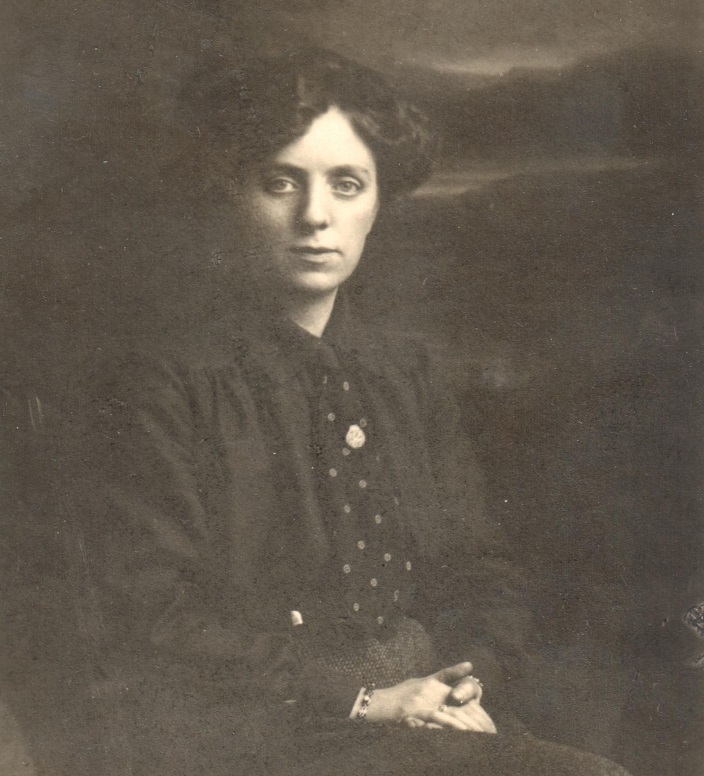 Among those proposed by some (including the Irish Congress of Trade Unions and Sinn Féin) for inclusion was Winifred Carney (1887-1943), a stalwart of the Belfast trade union and socialist movements over many decades. The suggestion has proven divisive, and this week it was announced that Carney would not be honoured with a permanent statue at City Hall, the proposal blocked by the Democratic Unionist Party (DUP) as well as British Labour’s affiliate in Northern Ireland, the Social Democratic and Labour Party (SDLP). Carney’s name is increasingly familiar in Ireland today, following the centenary of the 1916 Rising. She is remembered romantically and simplistically as the faithful secretary of James Connolly during the fighting in Dublin’s General Post Office. To popular memory, she is the ‘typist with the Webley’, who legend has it marched into the building with a typewriter under her arm and a Webley revolver in hand. One Volunteer in the GPO remembered her somewhat dismissively as James Connolly’s “grim and hero-worshipping secretary.” In truth, her relationship with Connolly was one built on mutual respect and years of familiarity in struggle. The slavery of the Spinning-room is the worst and least excusable of all. Spinning is a skilled trade, requiring a long apprenticeship, alert brains, and nimble fingers. Yet for all this skill, for all those weary years of learning, for all this toil in a super-heated atmosphere, with clothes drenched with water, and hands torn and lacerated as a consequence of the speeding up of the machinery, a qualified spinner in Belfast receives a wage less than some of our pious millowners would spend weekly upon a dog. With her close friend Marie Johnson, the wife of later Irish Labour Party leader Thomas Johnson, she worked actively within an emerging radical trade union movement in the city. The Johnsons were politically close to Connolly, and both Johnson and Carney were proactive supporters of the establishment of the Irish Textile Workers’ Union, a sister body to Connolly and James Larkin’s Irish Transport and General Workers’ Union, in 1911. By the following year Carney was Secretary of the ITWU, working alongside activists like Ellen Gordon to win working women into the ranks of the union. 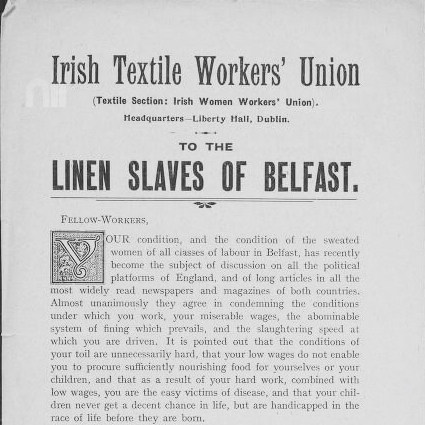 The 1913 Manifesto of the Irish Textile Workers’ Union was signed by Winnie Carney, Ellen Gordon and James Connolly. Still, organisations like the Irish Women’s Franchise League combined a desire for Irish national self-determination with suffrage activism. Carney, and many other women active within the nationalist women’s organisation Cumann na mBan [The Women’s Council] in Belfast, found that the suffrage and national questions need not be hostile to one another. Carney’s view that “James Connolly honoured me with his trust and confidence in a way he did with no other person” was unquestionable. Through difficult periods, including the 1913 Lockout, which saw an organised attack on trade unionism by Dublin employers, she stood steadfast beside him. This was even the case when tensions between Connolly, leading the ITGWU in Belfast, and Jim Larkin in Dublin’s Liberty Hall, created real unease within the union. Winnie Carney had been the typist for many of James Connolly’s essays over the years and, with this work, developed a deep understanding of his politics. With Larkin’s departure for the United States in 1914, control of the union passed into the hands of Connolly. If proof of his faith in Carney was required, it came in early April 1916, when he summoned her to Dublin from Belfast and informed her of plans for insurrection formulated by workers’ militia the Irish Citizen Army and the leadership of the larger Irish Volunteers. In the days before rebellion she typed dispatches and mobilisation orders in Liberty Hall, the location where the Proclamation of the Irish Republic was printed. With the First World War raging across Europe, there was no question that Connolly would miss the opportunity to strike a blow in Ireland. 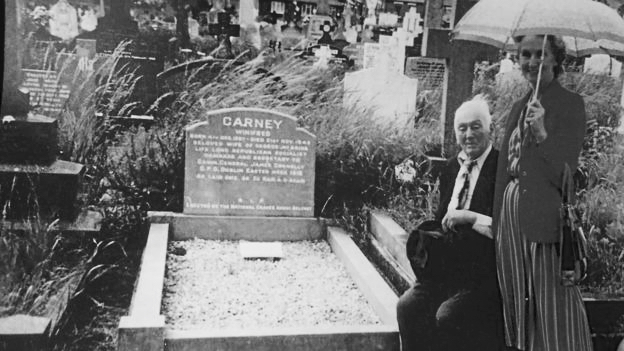 Carney was pictured by Connolly’s side in Walter Paget’s Birth of the Irish Republic. After her release from Aylesbury Prison, Carney threw herself back into radical politics in Belfast, and was chosen to contest the 1918 General Election as a Sinn Féin candidate. It was only in February of that year that women won the vote in Westminster elections, and Carney was one of the first to stand as a candidate. Though her politics were more red than green, Irish Labour had stepped aside in the electoral contest, essentially creating a referendum contest in much of Ireland between two Irish nationalist traditions, pitting the constitutional Irish Parliamentary Party against the republican Sinn Féin. Carney stood in a constituency that was regarded as unwinnable for the party, the staunchly Unionist Central/East Victoria Ward. While Sinn Féin’s other female candidate in the election, Constance Markievicz, was elected in Dublin’s Saint Patrick’s Ward, Carney was soundly defeated. She had been the only Sinn Féin candidate to contest the election on a manifesto that included a commitment to the ideal of a Workers’ Republic. Carney complained in private that “the organisation in Belfast could have been better – much better.” That the seat went to Donald Thompson, a Labour Unionist candidate and shipwright, was significant in its own right, with Labour Unionists taking three seats in the northern city. The Protestant working-class may have been comfortable voting for a labour candidate, but not a republican one. Carney opposed the compromise Anglo-Irish Treaty of 1921, which created an Irish Free State, remaining a political activist in the newly-created state of Northern Ireland, which was hostile to both republican and socialist ideals. In July 1922, her home was raided by the B-Specials, a paramilitary-like police force, who seized books which demonstrated “her connection with Bolshevism” and items relating to trade union organising and work on behalf of republican prisoners. In 1924, she joined the Northern Ireland Labour Party, which initially refused to take a position on the ‘border question’, a position it hoped would allow the party to build support across sectarian divisions. The party would secure three seats in the Northern Ireland General Election. Independent of both the British and Irish Labour Parties, the party would eventually declare itself in favour of Union with Britain in 1949, something which reflected the political will of its Protestant-majority membership but alienated it from the Catholic working-class. Through the NILP, Carney met George McBride, a Protestant veteran of the First World War, born on Crimea Street, Shankill Road, in 1898. 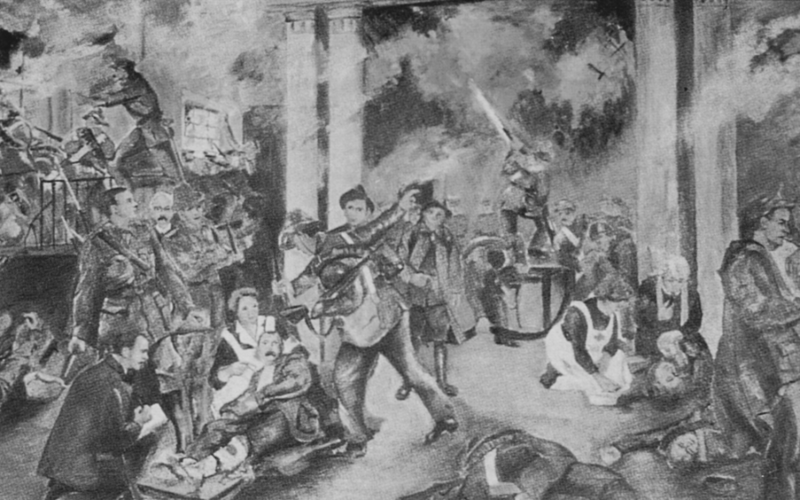 Ironically, McBride had been a member of the Ulster Volunteers, the organisation whose founding had prompted the emergence of the Irish Volunteers alongside whom Carney had fought in the Easter Rising. Though from a Unionist background, McBride was shaped from a young age by a tradition of working-class trade union militancy, having heard Jim Larkin speak as a boy when “his magnificent physique gave him mastery. He was like the Arc de Triomphe on the march.” Married in 1928, they shared a deep personal affection that could see beyond political disagreement. George McBride with Winnie’s sister at her grave. McBride would later recount to Carney biographer Helga Woggon that “she was a nationalist and a socialist, but her basis was nationalism, whereas mine was socialism.” Their relationship has inspired a recent book, Winnie & George: An Unlikely Union, while McBride was referenced in several 1916 centenary pieces as a “Protestant Orangeman.” A desire for such a story, of hands across the sectarian division, is perhaps more shaped by contemporary political concerns than historical accuracy. Whatever of their different backgrounds, McBride and Carney were strongly bound by a shared sense of socialism. Things are changing at Belfast’s City Hall. If Queen Victoria is to be joined by another woman – or if her plinth is to be vacated – the city could do worse than to remember Winnie Carney, one of its own who committed her life to Belfast’s workers.